Scientists in Jena, Borstel, Aberdeen and London have discovered a toxin in the fungus Candida albicans, which plays a crucial role during human mucosal infection. Their pioneering study has now been published today (April 7) in the journal Nature. Throughout evolution, pathogens have come up with many tricks to infect and damage their hosts: viruses capture whole cells and turn them into factories for their own replication until the cells are exhausted and die. Infectious bacteria produce multiple molecules that can manipulate the host cell's metabolism or simply destroy it. But what about human pathogenic fungi? It is well known that certain fungi produce poisons which, if accidentally consumed, can result in sickness or even death. However, up until now, production of host cell-destroying toxins by the microscopic fungi that can infect us has never been shown. For decades, scientists have been looking for the molecules that are directly responsible for tissue damage during the course of fungal diseases. However, they did not find toxins in pathogenic fungi that directly damage their infected hosts, and distinguishes these dangerous species from their harmless relatives. This is regrettable, since such knowledge would have been of great value for understanding human fungal infections and for taking therapeutic countermeasures. Hence, the discovery by the British-German team of researchers came as quite a surprise. Microbiologists from Jena, Borstel, Aberdeen and London succeeded for the first time in identifying a real toxin in Candida albicans – a usually harmless gut-dwelling yeast, which frequently causes diseases such as thrush. Candidalysin, as the new toxin was called, destroys human cells by forming holes in their membranes. The team of scientists elucidated this mechanism using cells of the oral mucosa as a model. Oral infections with Candida albicans commonly occur in HIV patients, but also in very young and elderly people with weakened immune systems. The initial impulse for the discovery came from Julian Naglik's research group at King's College London, who has been studying how human oral cells respond to fungal infections. The team of Bernhard Hube at the Leibniz Institute for Natural Product Research and Infection Biology – Hans Knöll Institute – (HKI) in Jena, Germany, investigated the interactions between fungus and host on a molecular level and demonstrated that Candidalysin actually damages the host cell. In addition, the biophysicist Thomas Gutsmann at the Leibniz-Center for Medicine and Biosciences in Borstel and his group studied the precise interaction between the fungal toxin and the cell membrane. Additional researchers in the UK and the USA also contributed data. The discovery of Candidalysin was made possible by a successful combination of interdisciplinary expertise. But why did it take researchers several decades of intensive investigations to find the crucial molecule? Similar toxic compounds have long been known from other microbial pathogens. Here, the trick is that Candida albicans initially produces a much larger molecule – a polypeptide. The gene encoding for this polypeptide has long been known; however, its function remained elusive. Until now. Using state-of-the-art analytics and building on recent insights, the team successfully detected and characterized the small molecule. They realized that the polypeptide is cut into small pieces inside the fungus by a certain enzyme, but only one of these peptide fragments is the newly discovered toxin Candidalysin. The scientists chose this particular name because the peptide contributes to the destruction – the "lysis" – of the cell. From a harmless precursor, the dangerous toxin is only produced when it is actually required by the pathogen. The production of this toxin is tightly linked to a morphological switch, which is crucial for disease. Candida albicans grows in two different forms: either as an egg-shaped yeast cell or as a filamentous hyphal form. In the human body, small numbers of yeast cells are harmless and our immune system realizes that it does not face any (immediate) danger. However, when invasive filaments are formed, they release Candidalysin, and it is the of the toxin itself that is recognized, acting as a "red alert" signal. 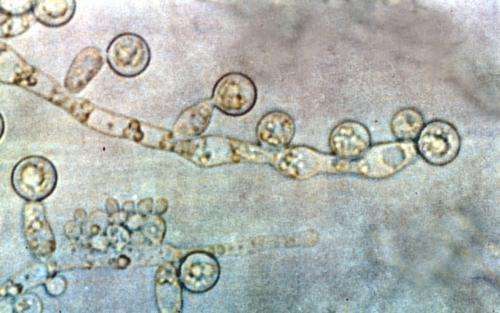 Duncan Wilson at the University of Aberdeen says "This is an important observation, because it finally provides a molecular explanation to a question that has puzzled the field for decades: why are hyphae the virulent morphology of Candida albicans? The fungus Candida albicans and its toxin Candidalysin will continue to keep scientists asking questions for many years to come. How does the toxin interact with the immune system? Does the toxin also have activity against bacteria and does this have any effects on common habitats such as in the human gut? What role do other genetic components of the fungus play during infection?